Location: Near Keystone, about 10km east of Mount Rushmore State Memorial on State Hwy. 40. Open: Jun-Aug 8-20, May, Sep-Oct 9-17. Fee: Adult (13+ years) US $7, Child (7-12) US $4, Groups () Adult US $4.50, Child (7-12) US $2.25 (all prices + 5% tax). 1876 discovered by placer miners. Image: A formation in Mt. 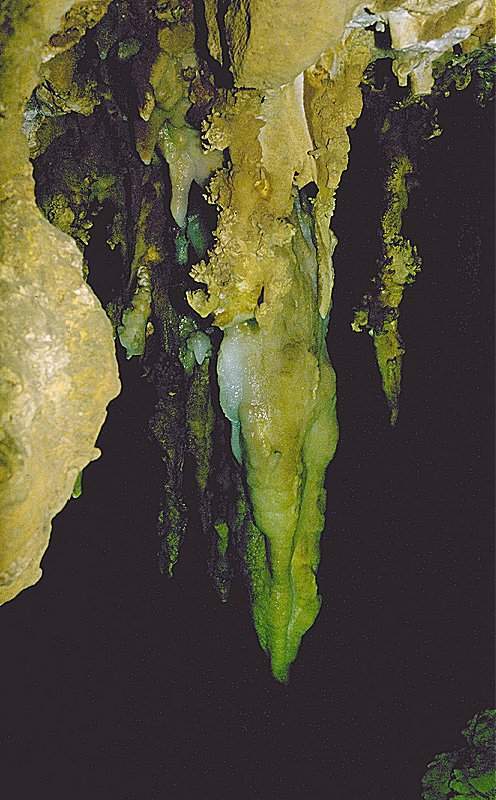 Rushmore Cave with a blueish colour caused by copper. Mt. Rushmore Cave is very famous mainly because of its location. Just a few kilometers from Mt. Rushmore, it participates on the Mt. Rushmore visitors. Nevertheless it is a nice and very interesting cavern. The geological situation in the Black Hills is unique, as the pahasapa limestone contains various interesting ore vein, caused by the granite of Mt. Rushmore (See the South Dakota page for a geological introduction). It is typical, that miners - following the ore veins - discoverd this cave. 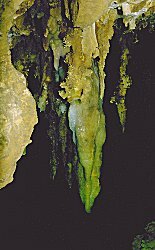 The minerals and ores, corroded and oxidized by the water, produce fascinating colorful limestone formations. The strange and rare minerals all around Mt. Rushmore Cave are very interesting. The most spectacular feature of the cave is, at least according to the owner, the Big Room. Search Google for "Beautiful Rushmore Cave"